As the newest member of the Six Saviors, Nico has a distinct and rare gift. He can visit others in the most private and secret place: their dreams. Shunned early in life and blamed for the ruination of his family, Nico doesn’t use his ability often, and appreciates the Six Saviors and their mates trust him not to walk in their dreams, a trust he couldn’t achieve with his own parents. Alaina, abandoned at birth, grew up in foster homes. At age seventeen, she was on her own. Dark thoughts of killing others have plagued her since childhood, and she doesn’t understand where they come from or why she has them. An explosive event brings Nico, the rest of the Saviors and Alaina together, and Alaina finds out the origins of who she is and her dark thoughts. As a Colonist targets Alaina and the murder rate rises in Phoenix, Nico must use his ability to not only evaluate Alaina’s psyche, but also find out who is ultimately responsible for the deaths plaguing the city. “So tell me all about this dream-walker stuff, Nico,” Noah said as he leaned back in his leather chair. Nico sighed. It had been six months since he was taken in by the Six Saviors, and no one had brought up his so-called gift of dream-walking. He just assumed they all trusted him to stay out of their dreams, but apparently not. And they shouldn’t, but he needed to convince them otherwise. He hated lying, but didn’t think the truth would go over very well. Jesus, with this lying stuff down, he should think about becoming a politician. It wasn’t as if he dream-walked all the time. In fact, he’d only done it once on his own since he moved in. Nico sat up, surprised. He ran his hand through his hair as guilt ate at his gut. He liked that Noah trusted him, and hated that he shouldn’t. He made a vow to himself to not dream-walk on any one of the Saviors or their mates again. If he had to do a Tambaran and stab himself in the gut like Cohen did, he would. Throughout his life, he was marked with a scarlet X, so to speak, and people avoided him as word of his ability spread. No one wanted to be around someone who could invade the personal space of dreams. He was a loner, excommunicated from his family, from his people, and wanting nothing more than to belong. That was why it was critical to him that Noah and the rest of the Saviors, their mates, and that half-breed Blake knew that he could be trusted to not invade their dreams. He finally felt he had landed in a place where he belonged—a place where he was accepted. He didn’t want to do anything to break the trust the others had in him. Well, he wouldn’t do it again. I can’t wait to read the next book in the series!!!! It is long over due!! I have just re-read all of the books and I am eagerly awaiting this next instalment. Would love to see poor Blake find love though. I am an avid reader. I read on my lunch break at work so that I can get out of my own head and into a great story. When I go back to work I feel like I had a mini vacation. Thanks, Carly. 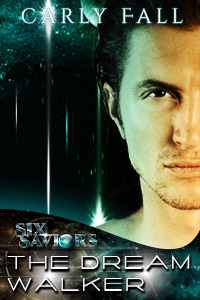 I love the Six Saviors series and I am greatly anticipating Nico’s story. I love how author’s can write so many different aspects of the paranormal and fantasy, it’s mind boggling. I love this series, fantastic job! I have read this series and can not wait for this next book to be released. So glad to hear that it will be out soon, but not soon enough for an avid reader such as myself. LOL . I absolutely love the way you make all the characters seem like they are standing right in front of me and like I an living their adventure. Love your work!! Please enjoy what is left of the summer. I love the six saviours series. I only discovered the books two weeks ago and I have zipped through the full series! Its my new addiction. I can’t wait for the Dream Walker to be published so I can slip back into that world. Thanks for stopping by, Mary! I’m glad you are enjoying the Six Saviors! I absolutely love the Six Saviors Series and haven’t been able to stop reading them. I have it on my Android phone and my laptop, and read until all hours of the night. I was really bummed when I got to the end of the last book, and didn’t know that there were any more Six Saviors books coming out. I am so glad to see that the series hasn’t ended, although I hate that Talin is no longer a part of the Saviors (RIP). Keep up the good work with the stories, and please don’t let the series die out. It’s a wonderful series, and I would hate for it to end anytime soon. Thank you for all the hard work you’ve put in to it. I know you have a life outside of writing buuuuut I sure hope this series never ends! I am so looking forward to this book! Thanks for bringing Six Saviors to life. OH HAPPY DAY! THE ANGELS SANG AND ALL THE SAINTS IN HEAVEH HEAVED A SIGH OF RELIEF! Another Carly fantasy from her very fertile imagination!!! Am I the only male who reads this series? Or the “Dark Forces” Series (Which I really miss…)? I think I’m about to re read this series!!! I loved it then and remember I couldn’t wait for the next book!!!! Bought the book on Friday at approximately 10:00 p.m. eastern time. Finished it approximately 2:00 a.m. Saturday morning. Enjoyed this book as much as the others. The tension between NIco and Alaina may require some readers and fans a cold shower.. or warm body (lol). Keep up the great work, Carly!